We’ve just plugged into Mixcloud so you can now automatically list your upcoming Gigs on your Mixcloud profile! 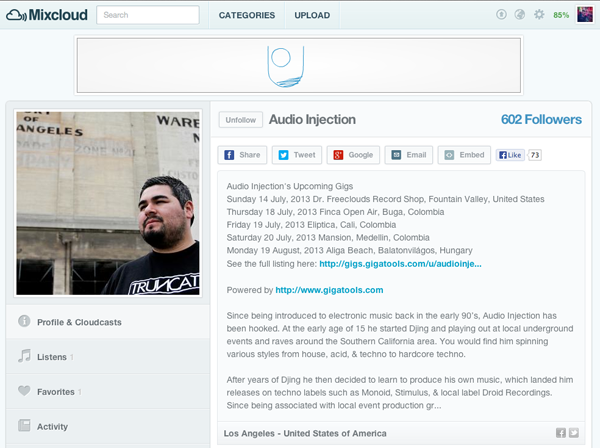 Simply log into GigaTools and follow the link to Edit User and from that page, Connect to Mixcloud. You will then be taken to the Mixcloud site where you can grant permission to the GigaTools Mixcloud App and from then on, Your Mixcloud profile will feature a micro Gigs listing and a link to your GigaTools profile page which we will update daily. This entry was posted on Monday, July 29th, 2013 at 12:11 pm and is filed under News. You can follow any responses to this entry through the RSS 2.0 feed. Both comments and pings are currently closed. Get 50% off the signup or renewal price! Add a Soundcloud Set to each of your Gigs! Add images to each of your Gigs! What happens when i upgrade? Easily integrate your upcoming Gigs schedule with any number of sites & social networks such as Facebook, Twitter & Soundcloud as well as in your own blog or custom website. Update all your sites instantly from the one place! Save hours of time each month by managing multiple schedules for all your artists from the one place and ensure all your artists' upcoming Gigs are always up to date across all of their various internet sites & social networks. GigaTools is DOPE! keep all my sites & social networks up to date from one place? Awesome! We love GigaTools, all of the CLR Artists use the program. Its perfect that with one single entry, all of our websites and social networks are updated instantly.